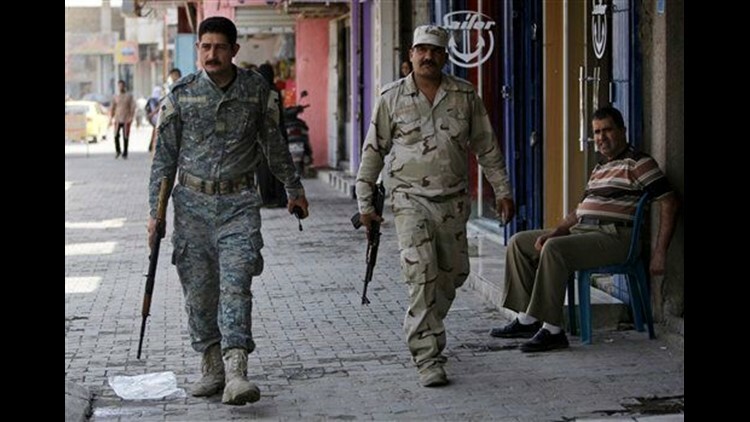 BAGHDAD (AP) — Gunmen in Iraqi military uniforms raided a village outside Baghdad and killed at least 24 people in an execution-style attack, apparently targeting a Sunni group that revolted against al-Qaida and helped turn the tide of the Iraq war, authorities said Saturday. The attack late Friday comes amid increasing concerns that insurgents will take advantage of Iraq's political turmoil to further destabilize the country, nearly a month after parliamentary elections failed to give any candidate a decisive win. Many fear a drawn-out political debate could spill over into violence and complicate American efforts to speed up troop withdrawals in the coming months. Some of the victims in Friday's attack suffered broken arms and legs, indicating they had been tortured before they were shot, police said. One witness said many of the victims were so badly brutalized that they were "beyond recognition." Five of the dead were women. At least seven people were found alive, bound with handcuffs, authorities said. Baghdad's security spokesman, Maj. Gen. Qassim al-Moussawi, said the killings about 15 miles (25 kilometers) south of Baghdad bear "an obvious al-Qaida hallmark." Police cordoned off the area and forced residents to stay inside their homes as helicopters swarmed overhead and authorities searched for suspects. By late afternoon, 25 people had been arrested, al-Moussawi said. "The area has many orchards and streams, so it is difficult to secure," he told The Associated Press. Many of the dead were members of a local Sahwa, or Awakening Council — one of several names for the Sunni fighters who changed the course of the war when they revolted against al-Qaida in Iraq and joined the Americans in late 2006 and 2007, officials said. The fighters also are known as Sons of Iraq. The killings are reminiscent of those that plagued Baghdad at the height of the sectarian bloodshed of 2006 and 2007, when men, sometimes dressed in police or army uniforms, snatched people from their houses at night before killing them and dumping the bodies. Similar violence still plagues the country, although not as frequently. In November, gunmen in Iraqi army uniforms abducted and killed 13 people in the village of al-Saadan near the town of Abu Ghraib on Baghdad's western outskirts. Members of the Iraqi military have been accused in the past of taking part in such extra-judicial killings, but their uniforms are also widely available on the open market and have been used by insurgents in the past to conceal their identities. A senior Iraqi army official who arrived at the scene of the crime Friday evening said the bodies were handcuffed and had been sprayed up and down with machine gun fire. The official also said witnesses told him the gunmen tricked the residents into trusting them by saying they were coming to ask them how they were faring in their village. He spoke on condition of anonymity because he was not authorized to release details publicly. The attack happened in a rural village in Arab Jabour, a collection of industrial zones, villages and palm and citrus groves in the Sunni belt around Baghdad's southern doorstep, said Mustafa Kamel, a Sahwa leader south of Baghdad. Arab Jabour is a gateway to the capital that was used by insurgents before they were crippled by the U.S. troop surge in early 2007 and the Sunni militia uprising. In an airstrike in January 2008, American warplanes dropped 40,000 pounds of bombs in just 10 minutes on an area of Arab Jabour to clear one of the last insurgent strongholds in the area. The Awakening groups soon took over across Arab Jabour and many Sunni areas around Baghdad, becoming de facto security bosses and grass-roots spymasters with a steady American paycheck. But the question of what to do with these nearly 100,000 people in the long-term remains. The U.S. handed over control last year of the Awakening Councils to Iraq, which pays their roughly $300 monthly salaries. Many of the Sons of Iraq were former insurgents who later teamed up with the Americans against al-Qaida in Iraq. The move, known as the Awakening, was credited — along with the surge of tens of thousands of U.S. troops — in helping quell the violence. Friday's bloodshed coincides with dealmaking maneuvers by Iraq's major political groups. Former Prime Minister Ayad Allawi's cross-sectarian bloc tapped into heavy Sunni support to come in just two seats ahead of the mainly Shiite list of the incumbent, Prime Minister Nouri al-Maliki in the March 7 vote. But neither side has enough seats to govern alone. On Friday and Saturday, an influential anti-American cleric — and potential kingmaker — held an unofficial poll of his supporters, asking them to decide which candidate he should throw his support behind. The poll has no legal standing and there is no way to verify the winner, who will get the backing of some 39 Sadrists who won parliamentary seats in the March 7 election. The winner was expected to be announced late Saturday or Sunday. Elsewhere in Iraq, a customer at a liquor shop in northern Baghdad was killed Saturday after militants planted a bomb outside the shop's gate, police said. And on Friday, police in the northern city of Mosul said 23 detainees awaiting trial on charges of "terrorist crimes" escaped from jail. Associated Press writers Adam Schreck, Hamid Ahmed and Bushra Juhi contributed to this report.